A Russian-Ukrainian Zenit booster was moved to its Baikonur Cosmodrome Launch Pad on Sunday as the first of its kind to take flight in over two years, starting what is hoped to be Zenit’s resurrection as relations between the once-interconnected space industries of the two involved countries slowly mend. 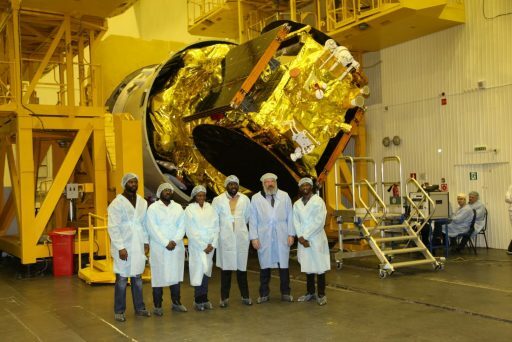 Liftoff from Baikonur’s Site 45/1 is set for 19 UTC on Tuesday and Zenit, outfitted with a Fregat SB upper stage, will be tasked with a multi-hour mission to directly deliver the first Angolan communications satellite to Geostationary Orbit. Zenit, with over three decades of operation and more than 80 missions under its belt, had fallen victim to the conflict between Russia and the Ukraine over the annexation of Crimea in 2014. 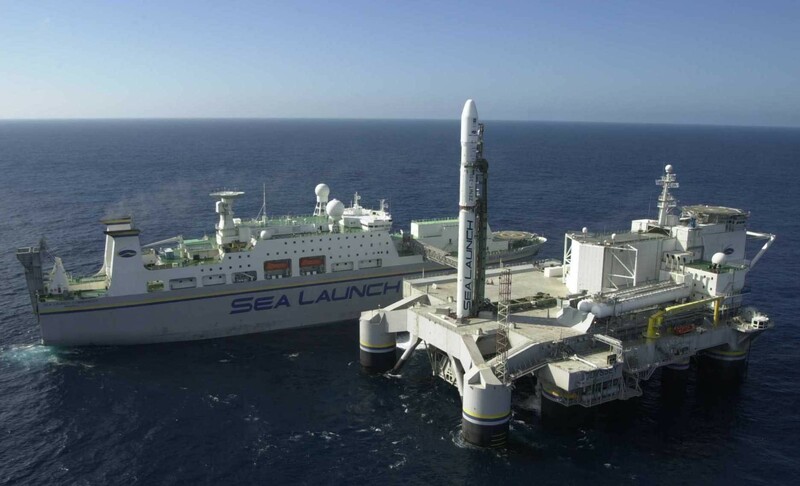 Employing Ukrainian-built stages and Russian engines, production of Zenit came to a halt as relations between the two countries deteriorated, also marking the final nail in the coffin for the multi-national Sea Launch venture that had struggled financially before the Ukraine crisis. Hardware for two or three Zenit missions remained at the Baikonur as the situation unfolded in the second half of 2014 and into 2015 while the Sea Launch infrastructure – two sea-going vessels and the home port facility in Long Beach – were taken out of operation and placed on the market for potentially interested parties. 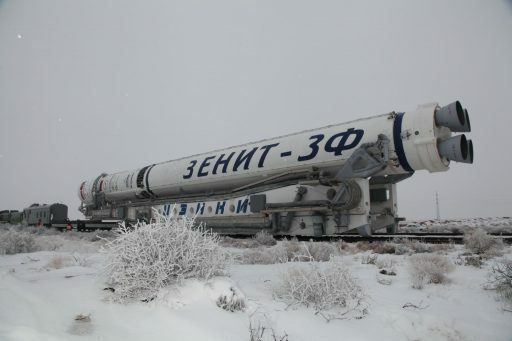 A one-off agreement was reached in 2015 with much political back and forth around the Ukrainian launch processing team traveling to Baikonur to ready one of the Zenits remaining in storage for flight with the Elektro-L No. 2 meteorological satellite. 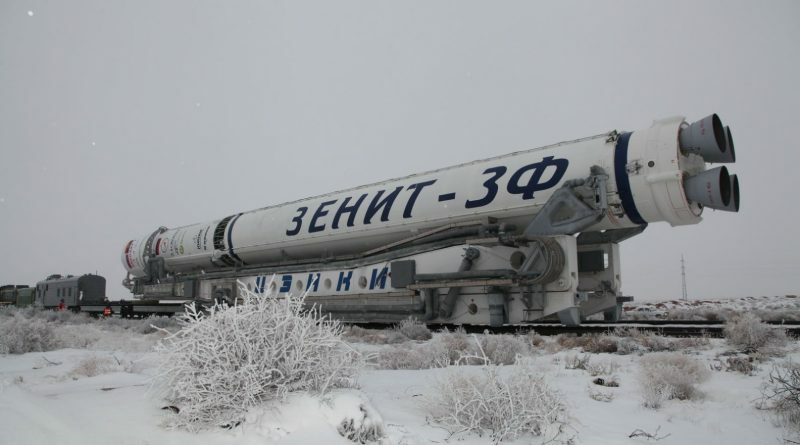 The thunder of Zenit’s mighty RD-171M engine roared across the Baikonur Cosmodrome on December 11, 2015 when the vehicle took flight on what many believed would be Zenit’s swan song. Some optimism emerged in 2016 when the S7 Group, owner of S7 Airlines, announced they were purchasing Sea Launch and all its assets, including the Sea Launch Commander Ship and the Odyssey launch platform. That October, a meeting was held with Russian and Ukrainian space officials plus all interested parties in resurrecting the Zenit, resulting in a nonbinding agreement calling for Russia to order up to 12 Zenit vehicles – still pending final green-lighting by the political leadership of both countries. 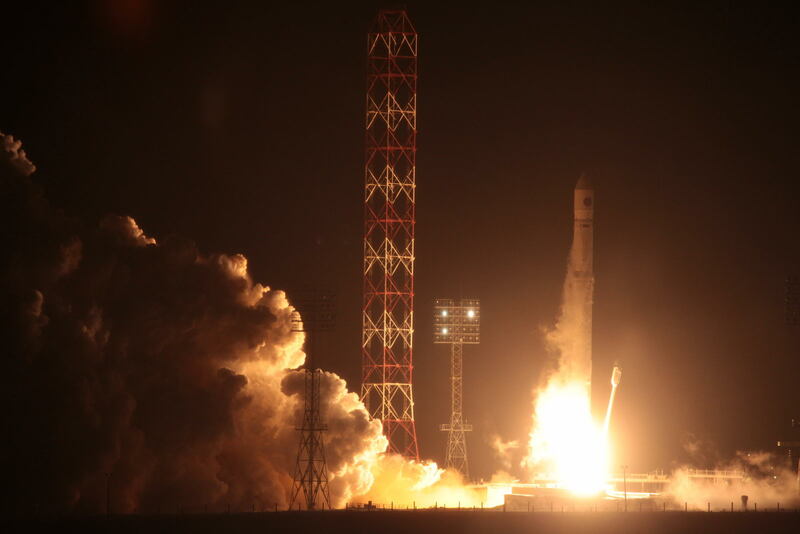 The meeting also resulted in the decision to allow the launch of a Zenit rocket with the AngoSat 1 communications satellite, initially targeting mid-2017. In a repeating pattern, the departure of Ukrainian engineers for the Baikonur Cosmodrome was made a political bargaining chip by both sides – delaying the readiness of the Zenit booster until at least December. Eventually clearing all political hurdles, teams were able to travel to Baikonur to complete refurbishment steps on the booster that had already crossed its warranty date. 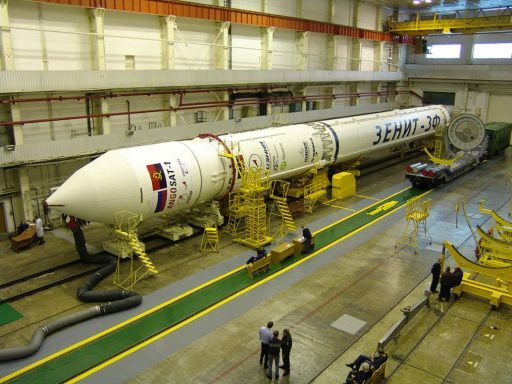 AngoSat 1, manufactured by former Sea Launch majority holder RSC Energia, arrived at the launch site in November to undergo final checkouts before taking its place atop the Zenit rocket. The 1,647-Kilogram satellite is based on Energia’s Universal Satellite Platform and hosts a hybrid communications payload built by Airbus Defence and Space, comprising 16 physical C-band and six Ku-band transponders to deliver TV broadcasting and telecommunications services to Angola as the African nation’s first owned geostationary satellite. Tuesday’s launch will mark the end of an eight-year journey to the launch pad for the satellite, overcoming financial hurdles and waiting for a launch opportunity as it initially targeted a sea-based Zenit launch, was then switched to the second Angara A5 flight that is still waiting for a launch date and moving back to a Zenit launch out of Baikonur. Starting its journey, AngoSat is hoped to operate for 15 to 18 years from an orbital position at 14 degrees East in Geostationary Orbit. 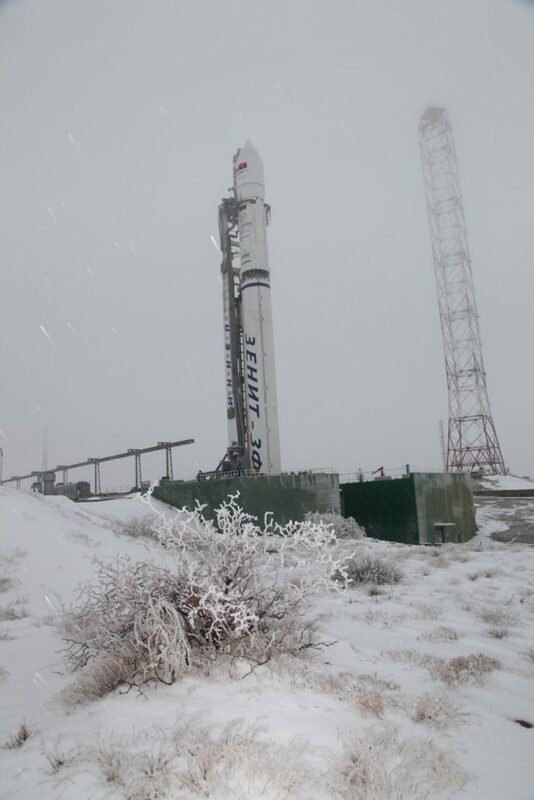 AngoSat’s liftoff was pushed from December 7th to the 26th due to problems with a fuel valve on the Fregat SB upper stage when it was undergoing propellant loading in the second half of November. The failure of a Soyuz/Fregat rocket lifting the Meteor-M 2-1 satellite and a group of international secondary satellites on November 28 did not affect this mission since the failure mechanism was quickly traced back to a previously unknown software bug within the guidance algorithm that can only manifest itself for launches from the Vostochny Cosmodrome due to the geographical orientation of its Soyuz launch complex. Moving toward Russia’s year-closing launch, engineers completed the encapsulation of the Fregat-AngoSat stack on Monday followed by installation of the upper composite on the two-stage Zenit rocket on Wednesday. The assembled Zenit-3SLBF, also known under the simpler designation Zenit-3F, was rolled to Baikonur’s Site 45/1 in snowy conditions on Sunday morning to enter the typical two-day on-pad processing campaign comprising the final checkouts of the vehicle ahead of an overnight countdown to an early morning liftoff on Wednesday, local time. 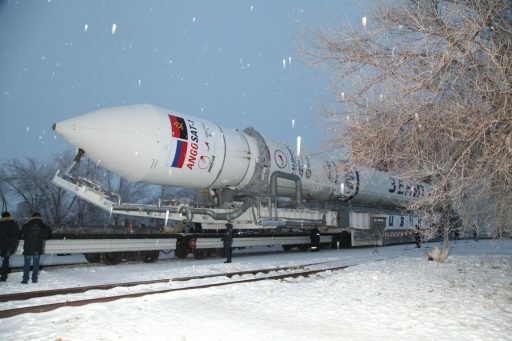 Pending clean checkouts of the vehicle and the green light from the Russian State Commission, teams will initiate propellant loading on the vehicle at T-2 hours and 30 minutes – starting with loading some 296 metric tons of -183°C Liquid Oxygen followed one hour later by the start of Kerosene tanking to transfer 113 metric tons to the vehicle’s tanks. The Transporter Erector will be lowered at T-15 minutes and move to a safe distance as Zenit enters the final minutes of the count, pressurizing its tanks and switching to internal power with under two minutes to go. Zenit stands 54 meters tall and weighs 457 metric tons at liftoff, hosting the world’s most powerful liquid-fueled engine on its first stage to lift the vehicle off the pad with a thrust of 7.55 Meganewtons through four combustion chambers. RD-171M will come to life at T-3.5 seconds for thrust build-up and engine monitoring before the vehicle will start rising with liftoff targeted for exactly 19:00:00 UTC on Tuesday. Balancing on its four-chamber main engine, Zenit will climb vertically to depart the Baikonur launch site – showing off its characteristically shaped exhaust plume merging from bright orange to a bluish hue due to the engine’s particularly oxidizer-rich mixture and very high chamber pressure. The four nozzles will individually gimbal to steer the rocket onto its departure path to the north-east, heading toward the border between Kazakhstan and Russia. The first stage will consume nearly 327 metric tons of propellant in less than two and a half minutes, shutting down its RD-171M engine two minutes and 25 seconds into the flight. At that point, the RD-8 vernier engine on the second stage will already be firing to pull the second stage away from the 32.9-meter long booster. When the second stage is clear of the spent first stage, it will fire up its RD-120 main engine to continue pushing toward orbit with a total thrust of 912 Kilonewtons. Separation of the protective payload fairing will occur just over five minutes into the flight and the second stage will shut down its main engine around the T+7:15 mark and continue firing the RD-8 vernier, itself delivering 78.5kN of thrust, for another minute and 20 seconds to push the upper composite into a preliminary Low Earth Orbit for Fregat SB separation 8.5 minutes after liftoff. Fregat-SB is the largest member of the Fregat Upper Stage Family, adding a torus-shaped Auxiliary Propellant Tank to the baseline Fregat version flying on the Soyuz rocket. It is 2.4 meters tall and 3.9 meters in diameter with a launch mass of 11,780 Kilograms, powered by a single S5.92 main engine that generates 14 to 19.85 Kilonewtons of thrust. Roscosmos did not publish a flight profile outline for the Angosat mission, though based on the satellite’s launch mass and target orbit it is safe to assume a standard three-burn trajectory into Geostationary Drift Orbit will be followed by the Fregat-SB upper stage, starting with a coast phase until around 74 minutes into the flight when the stage will execute a burn of around eight and a half minutes to empty out its Auxiliary Tank and push the orbit’s high point to nearly 5,000 Kilometers in altitude. Next would be a coast phase of a little over two hours with the second burn in charge of raising the apogee to nearly 36,000 Kilometers to match the satellite’s desired injection altitude at GEO. The mission then enters a long coast phase to allow Fregat to climb all the way to the apogee of the orbit where the third burn will occur to lift the perigee to match Geostationary altitude and reduce the inclination to as close to zero degrees as possible. Separation of the satellite would occur just before the mission hits nine hours duration.